Corinne was in a car accident when she was 15 years of age. After the accident she felt numbness in her hands, along with other symptoms which included severe menstrual cramps, mild depression and sinus problems for about 4 years or more. She also would get an upset stomach from eating eggs, wasallergic to cats and had poor circulation in her legs and feet. In September 2002 she was told that she had arthritis and Fibromyalgia. She had to miss work because of the pain and stiffness. Corinne could feel the difference just after her 1st adjustment. She was able to stand without pain, sinuses began to drain, she felt happier and not so depressed. Her overall health has improved greatly. She has less pain, less menstrual cramping and her allergies have disappeared. Thanks to Chiropractic and Dr. Bill my life has been changed to a much happier and healthier lifestyle. "I was very impressed with the chiropractic care I received from Dr. McCallum. I had received chiropractic in the past for my neck pain, but not to this level of care. After only a few sessions, my symptoms began to disappear, especially my neck pain, and I know I would not have been able to perform to my everyday work functions without the treatment I received." "As a receptionist, using my hands to type on a daily basis is a requirement. The work is speedy and is often intense throughout the day. Several months ago, every movement I made became excruciatingly painful. I started seeing Dr. McCallum and he put together a program for me that helped right away. He stressed the importance of my posture and proper hand and arm placement." 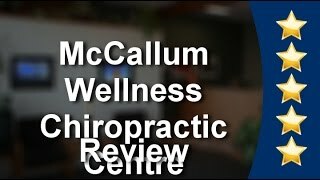 "I have benefited tremendously from the chiropractic care I received from Dr. McCallum. Not only have the adjustments helped alleviate my stiffness and aches, but they have helped me have more energy and just feel more balanced over all. A few months ago, I was able to resume a favorite hobby of mine: golf. Due to my previous pain, I never thought that’d be possible." "Dr. McCallum has allowed me to be headache free for quite some time now. I used to have daily nagging headaches that often would turn into a migraine leaving me unable to function. For the longest time, I thought the only answer was just keep taking medication to have the pain subside. No more treating symptoms, Dr. McCallum gets to the cause of the problem,"
"It's been 7 months since I wiped out on my snow board. I sought treatment at the hospital and they took x-rays and said everything seemed normal, that I would just have some pain for a few days. A few days actually turned into several weeks, so at the suggestion of my girlfriend, I went to see Dr. McCallum. He corrected the problems and now I m pain free, ready to hit the slopes again. His cold laser therapy really sped up the healing."